Another little project from AFTH. 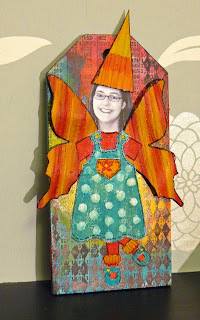 We created a tag with Claudine Hellmuth paints - which were beautifully vibrant and mixed really well, but I found them very unforgiving to work with. I'm not really happy with this project - the colour palette isn't me and there isn't enough contrast between the background and the figure. It's good for me to go outside my comfort zone though and I actually finished it so I'm blogging it! This is great - just my colours!